January 6, 2016 /0 Comments/in Birth Injury, Cerebral Palsy /by Reiter & Walsh, P.C. A 2013 Australian study found that grey matter injury was the second most common in magnetic resonance imaging (MRI) patterns for children with cerebral palsy. The severity and location of grey matter injury correlated with a classification system of cerebral palsy known as the Gross Motor Function Classification System (GMFCS). In this study, severe grey matter injury corresponded to levels IV and V, which are the highest levels of motor function impairment on the GMFCS. The authors of this study concluded that this data will be used for further research. Data was collected by Susan M. Reid, Charuta D. Dagia, Michael R. Ditchfield and Dinah Reddihough. Cerebral palsy is a disorder of movement and posture that results from an injury to the developing brain of a fetus, baby or young child. Different types of cerebral palsy are associated with different types of matter injury in the brain. Brains are made up of both white matter and grey matter. While grey matter processes information in the brain, white matter transmits signals to the body. Grey matter, which has a pinkish-grey color in the living brain, contains the cell bodies, dentrites and axon terminals of neurons, so it is where all the synapses are. White matter is made of axons connecting different parts of grey matter to each other. The study selected 54 children in total (37 males and 17 females) with cerebral palsy. MRIs were studied for symmetry and severity of cerebral palsy (brain) injury. The researchers were able to identify grey matter brain injuries on imaging that correlated with high GMFCS levels. High GMFCS levels (IV and V) were associated with spasticity, whereas grey matter injury to the basal ganglia (thalamus structures in the brain associated with movement and coordination) was associated with non-spastic and mixed motor types of cerebral palsy. In order to interpret and understand the clinical aspects and causes of cerebral palsy, it is important to understand the relationships between cerebral palsy and grey matter damage. Grey matter injury is associated with perinatal (before birth) hypoxia-ischemia (insufficient blood flow to the cells and organs combined with less than normal oxygenation to the blood) and hypotension (low blood pressure). When the hypoxic insult was severe, abrupt or prolonged, a deep nuclear-cortical pattern of grey matter injury was found on the brain imaging. Abrupt insults may cause grey matter injury to the globus pallidus (bottom right side of the brain), hippocampus, brainstem or supratentorial structures, like the cerebellum. Below are some combinations of the brain that can be affected by grey matter injury. The GMFCS is a classification system that organizes cerebral palsy into five groups based on the gross motor functions of an infant, child or adolescent with cerebral palsy. Children are evaluated based on age and independence. Then they are placed on one of the five levels based on their motor function ability. Within the study, the GMFCS is associated with grey matter injuries. Children with grey matter injuries that were deep in the cortical and subcortical (top and bottom) parts of the brain were classified as level IV or V. Read the chart below to understand the level differences. The study applied a rating scale based on the associations between the gross motor function level, pallidal (bottom, right brain) involvement and diffuse cortical (top brain) subcortical (bottom brain) involvement. Mild grey matter injury was associated with gross motor functions by 17 percent. Severe injury was associated with levels IV to V in the Gross Motor Function Classification System at 35.7 percent. Diffuse cortical-subcortical (top and bottom brain) injury resulted in spastic motor types in 12 out of 14 children. Severity of white matter loss also correlated to higher frequencies of epilepsy. Pallidal (bottom right brain) abnormality was a strong predictor of poor gross motor function. Non-spasticity was associated with extensive deep grey matter injury and non-diffuse cortical subcortical injury. The likelihood of epilepsy was highest where there was in cortical-subcortical involvement and white matter loss. The trial was performed in the Developmental Disability and Rehabilitation Research, Murdoch Childrens Research Institute, Melbourne; Department of Pediatrics, University of Melbourne, Melbourne; Department of Medical Imaging, Royal Children’s Hospital, Melbourne; Department of Diagnostic Imaging, Monash Children’s Hospital, Melbourne. 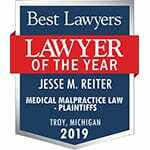 At Reiter & Walsh, P.C., we focus solely on birth injury law. We help the most vulnerable to get the resources they deserve. If you or a loved one suffers from a birth injury, contact us for a free case review.